Retailer organised Retail CXO Dialogue in collaboration with Hewlett-Packard and it brought together leaders from retail and food industry on a single ‘platform’, and highlighted the growth opportunities in both these sectors. The discussion panel of the event included Pawan Gadia, CEO, Ferns N Petals, Suchindran Chakravarthi , Tech Lead - CTO, Cocoberry , Sanjeev Pathak, Emerging Business and Attach, Printing and Personal System Group, HP. And, this event was moderated by Ritu Marya, Editor-in-Chief, Franchise India and she highlighted that consumers have become more ‘aspirational’, and consumer-based brands need to respond appropriately. Marya also pointed to the growth opportunities in the ‘masstige’ segment, which is neither premium nor mass, but at the same time suitably meets the needs of evolving consumers. In addition, Marya also raised her concerns relating to “lack of aggression” amongst senior managers and owners in the restaurant sector vis-a-vis e-commerce and other emerging sectors, for raising funds from private equity and allied channels. Panellists also highlighted their “growth story” over the past few years, and their future ambitions. It started as a single shop in South Extension, New Delhi nearly 20 years ago and the initial success led to another outlet also at Greater Kailash, South Delhi, and the third outlet was based on a partnership model, highlighted Pawan Gadia CEO, Ferns-N-Petals. And, with several requests for franchising, this chain leveraged this model suitably, and by ’01, they had seven outlets, along with FOCO (franchisee-owned, company operated). However, these FOCO outlets closed, subsequently. Gadia also highlighted that their first franchised outlet outside Delhi was at Chennai, and they were “hungry” for growth, which often resulted in outlets located in narrow lanes. However, the growth of e-commerce changed the business model, with nearly 40 per cent of sales derived from this segment. In addition, the emphasis on express and lounge outlets in its franchising model has led to 160 outlets on a pan India basis, the largest in this segment. 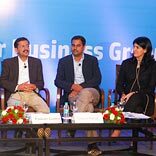 Asheeta Chabbra , Business Head - Chabbra 555 Fashions, and Balakrishnan Kandasamy, GM - IT , Bata India, highlighted the importance of franchising and technology-enabled solutions, respectively, in a bid to improve efficiencies in their store network. This chain opened its first store in ’09 in Defense Colony, South Delhi and the strong response from consumers for their frozen yoghurt led to ten additional outlets within a year, highlighted Suchindran Chakravarthi, Tech Lead - CTO, Cocoberry. The company has continued its growth strategy and currently has 40 outlets across the country. In addition, the emphasis has been on applications which support both the front-and back-end operations of this group. Chakravarthi, also pointed out that they have considered the online model, but it may not be viable for their product range, and are considering other growth models. Sanjeev Pathak of HP emphasised the role of technology in modern retail operations, and their objective to partner with organisations over the long-term.